I make guacamole a lot. Especially lately. And every single time I make it, I profess my love for it. It might be my current answer for, "What is your favorite food?" And when we eat it with chips, we have been buying these black bean tortilla chips. I don't get them because they are healthy, I just love those chips. And they come in a reasonable sized bag. Also, we have been cooking up a batch of beans and eating them throughout the week in various ways. It is a nice thing to have around. And it is a really easy ingredient to make various dinners from. Still haven't perfected the bean making process, but you can't really mess it up. This burrito is a combination of black beans, brown rice, queso fresco, lightly dressed greens and guacamole. I rated it a 10/10 of because it is everything it needs to be. And we have had it three times in the past week. Try brown jasmine rice...it is very good. Try this brand of whole wheat tortillas. Not all whole wheat tortillas are created equally. Whole Foods Boulder makes some amazing burrito sized whole wheat tortillas (in house). But don't get the 365 brand or the generic whole foods brand...not good. Also, queso fresco is amazing and I love it in these. But with the guac, you could easily leave the cheese out. Someday I should consider shooting in such a away that avoids AC units and cords in general. It's art guys. Prepare guacamole by mashing the avocado together with some salt and the juice of half the lime. Add the diced tomatoes, minced red onion and cilantro and mix to combine. Taste, adjust seasonings and set aside. In a skillet over medium high heat, add black beans, pureed chipotles in adobo, and enough water to allow the beans enough liquid to simmer in. Season with salt and pepper. Bring to boil and simmer until all the water has evaporated. Taste, adjust seasonings, and repeat process of adding water and simmering off until you reach the desired texture. 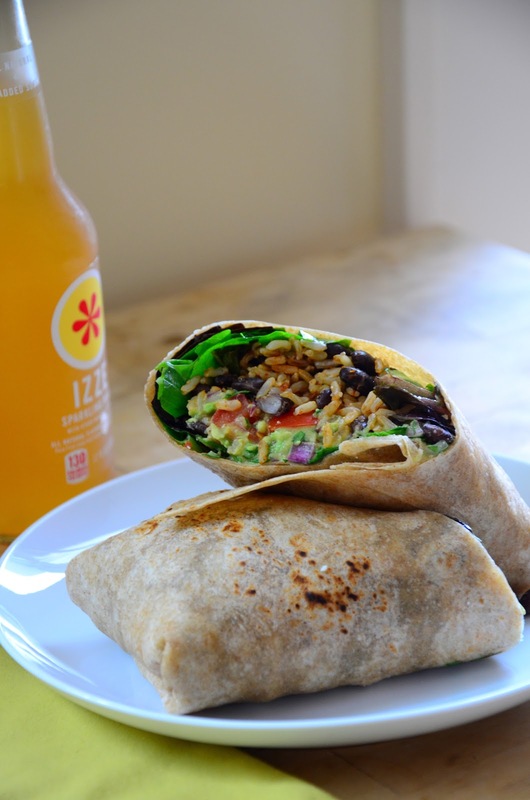 Add brown rice, mix and set aside over low heat until ready to assemble burritos. Combine the juice of the other half of the lime, salt, pepper and 1 tsp of light oil. Add in the spring mix or spinach and toss to coat. Assemble the burrito: Start by warming one tortilla to make it more pliable (either over an open flame or in the microwave wrapped in a damp towel). Mound up half the spring mix or spinach, top with half the rice and bean mixture, crumble on half the queso fresco and top with half the guacamole. Wrap it up burrito style. Repeat with remaining ingredients to make a second burrito.